Where the U.S. government kept its cash, before Fort Knox. In 1985, renovators of the Treasury Building made an unexpected discovery. Behind the walls of the old office of the Treasurer, they had stumbled across the forgotten armored vault that used to guard the U.S. government’s cash. 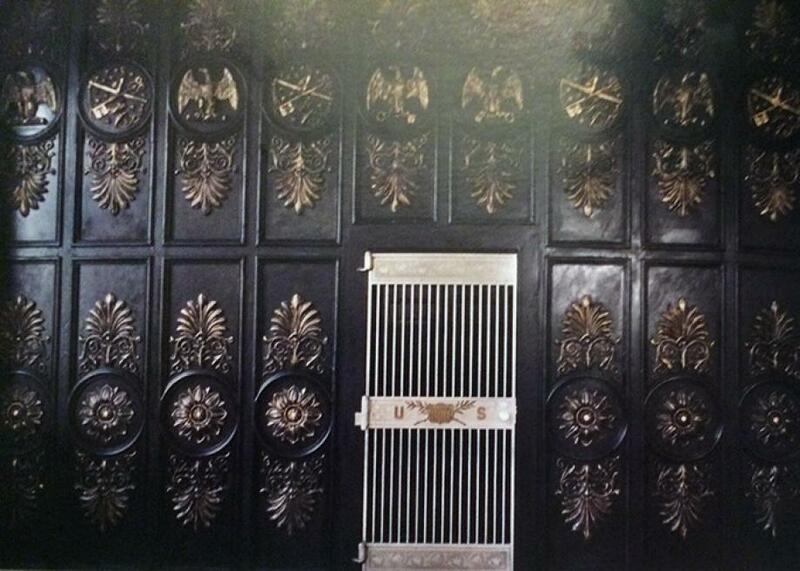 The old vault was designed in 1864 by Isaiah Rogers and employed a creative “burglar-proof” design. A double layer of large ball bearings were sandwiched between a metal housing—the theory was that an attacking drill bit would just penetrate one layer and get caught in the spinning balls. In any case, a retinue of 20 guards used to watch over the space to ensure that it never came to that. By 1881 the Rogers vault was crammed with $1 billion in securities, $500 million in bonds, and several million in gold and silver coins, as well as paintings, photographs, furniture, artwork, and other strange treasures. A pioneering female journalist named Emily Edson Briggs got a look inside in 1870 and reported on discovering several forgotten items including a bottle of rose oil (sent to Martin Van Buren by an Indian prince), hundreds of jewels, a snuff box, counterfeit coins and dies, and a hoard of Confederate currency. The vault fell into disrepair by the turn of the century, and a congressional inquiry blasted it as “a disgrace to the government and of such obsolete character and inferiority of construction and minimum of security as would cause them to be rejected as unfit for use by any country bank in a backwoods town.” The congressional report highlighted the Treasury guards as the vault’s most effective defense. Contemporary newspaper articles fawned over an advanced-for-the-time alarm system. The walls of the room were lined with a dense mesh of wires that, if disturbed from the outside, would send an electronic alert to a nearby guard station. The alarm would also activate if the connection between the guard post and vault were interrupted. The alarm “checked in” with the guard post every 15 minutes, 24 hours a day. The government moved its gold and silver reserves in 1935, per the Treasury policy to move large gold deposits out of cities exposed to enemy attack. The so-called “deep storage” loot is now stored at Treasury facilities in Fort Knox, Denver, and West Point. Contrary to some conspiracy theories, we know exactly how much gold is at each location.